Ripe mangoes and rum create a grown-up frozen treat that is the perfect complement to Latin and Caribbean fare. 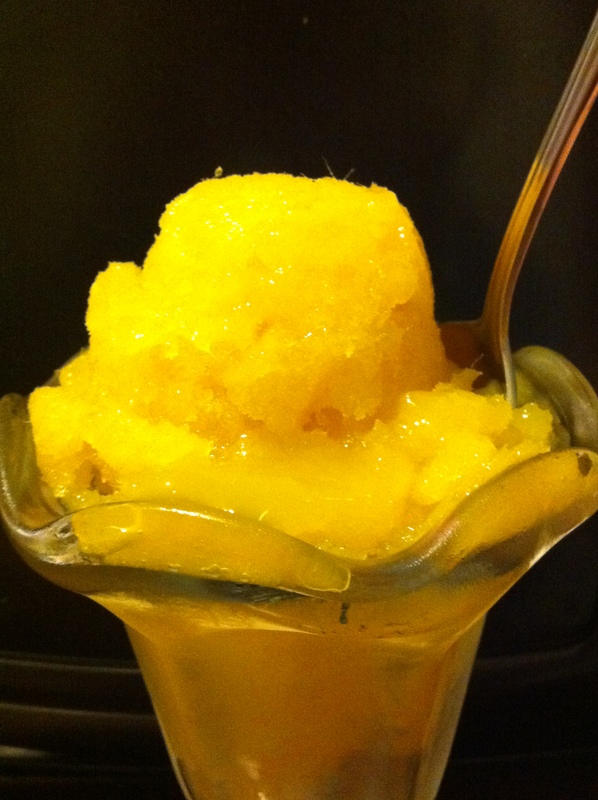 Use ripe mangoes to create this light and fruity sorbet that scoops up beautifully and is easy to make. A splash of rum turns it into a grown-up favorite that is the perfect accompaniment to Latin and Caribbean fare. Serve the sorbet in a frozen parfait glass or mango boat, made by scooping out the centers of halved mangoes and freezing the shells. Stir 1 1/4 cups water and sugar in heavy medium saucepan over medium heat until sugar dissolves. Increase heat and bring to boil. Add 2 cups sliced mangoes and return to boil. Transfer mixture to processor and puree. Pour into bowl. 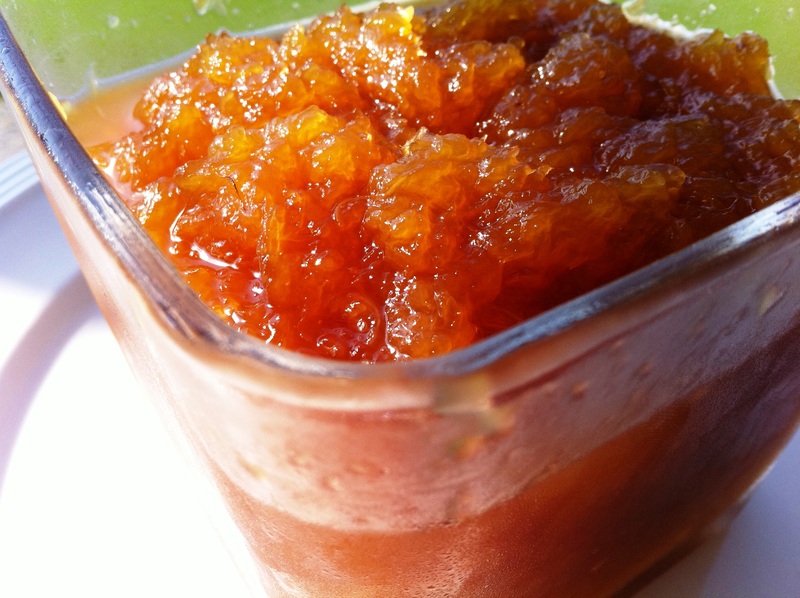 Refrigerate puree until cold, about 2 hours. Freeze 8 hollowed-out mango halves or parfait glasses 1 hour. Using ice cream scooper, scoop sorbet and place in mango halves or frozen glasses. Garnish with fresh mango slices and serve. Rhubarb is the perfect complement to fresh strawberries in this deliciously moist, subtly fruity and always yummy cake, particularly when you can purchase both items in season. Serve with your favorite coffee for a mid-morning snack or as a light after-dinner dessert. Preheat oven to 350°F. Butter an 8-inch square baking pan. Line with parchment paper, leaving a 2-inch overhang on two sides. Butter and flour parchment and pan, tapping out excess flour. Make streusel: Whisk together butter, brown sugar and salt. Add flour and mix with a fork until large crumbs form. Refrigerate until ready to use. 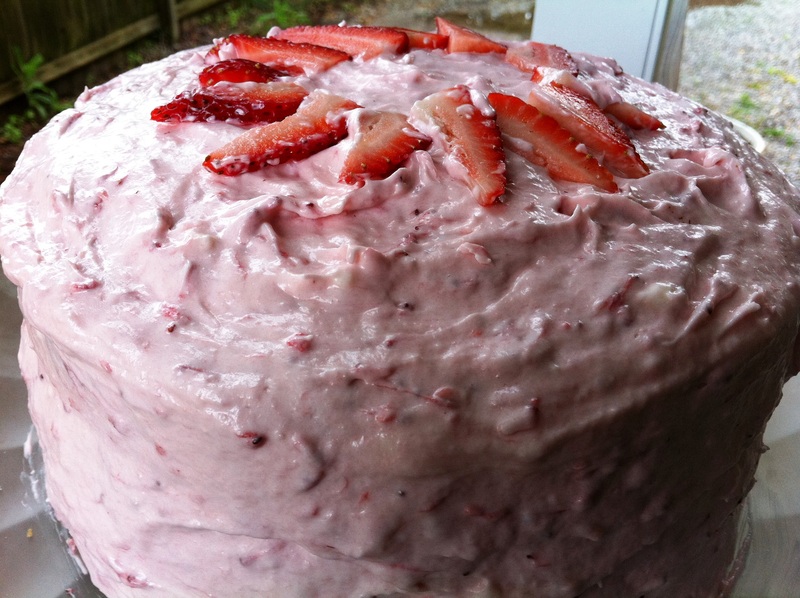 Make cake: In a medium bowl, combine rhubarb, strawberries, brown sugar and 1/4 cup flour. In another medium bowl, whisk 3/4 cup flour, baking powder and salt. In a large bowl, using an electric mixer, beat butter and confectioners’ sugar until light and fluffy; beat in eggs, one at a time. With mixer on low, beat in vanilla, then flour mixture. Spread batter in prepared pan. 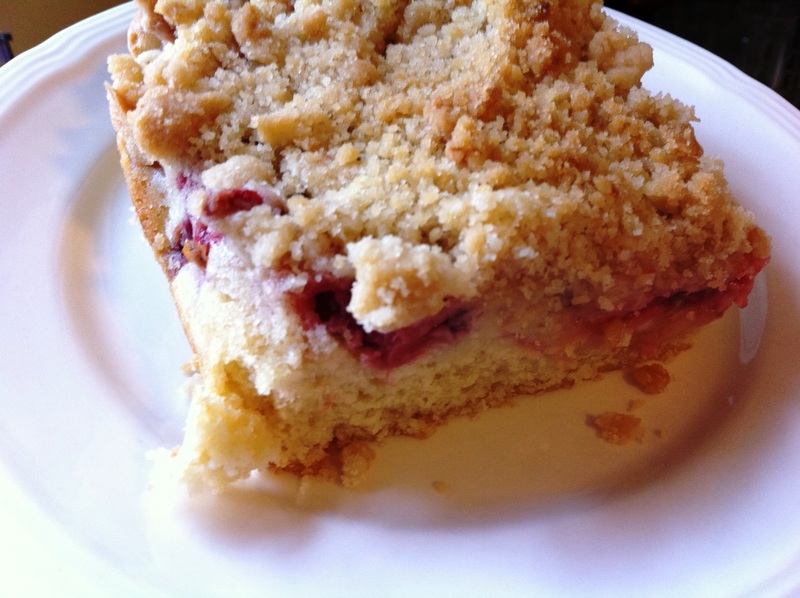 Sprinkle with rhubarb and strawberry mixture; top with streusel. Bake cake until golden and a toothpick iserted in center comes out with moist crumbs attached, 45 to 50 minutes. Let cool completely in pan. Using paper overhang, lift cake from pan. Cut into 9 pieces.